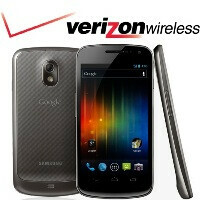 As you may recall, earlier this week Motorola showcased the new DROID RAZR for Verizon Wireless. Even though the device has a lot going for it, such as the dual core processor and Kevlar backing, some of its thunder was stolen by Samsung unveiling the highly anticipated GALAXY Nexus in Hong Kong. At that time, Samsung said there would be a 4G LTE version of the GALAXY Nexus, but neglected to say which carrier it would be for. Now we can drop all the speculation, as Verizon has officially announced they will be offering the Samsung GALAXY Nexus "later this year", though we're guessing it will be in November. Unfortunately, Verizon happens to leave out what the price of the GALAXY Nexus will be, and if they will be carrying the 16GB or 32GB version (or both) - as the phone will not have a microSD memory card slot. For those of you unfamiliar with the Samsung GALAXY Nexus, it is the first smartphone to run on Android 4.0.1 Ice Cream Sandwich, which offers an updated user interface with better multitasking, notifications, browser, face unlocking, and Android beam. If that wasn't enough, the GALAXY Nexus will feature a large 4.65" 1280x720 HD Super AMOLED display (though it is PenTile), a 1.2GHz dual core processor, 1GB of RAM, 5MP rear autofocus camera with flash & 1.3MP front camera, 1080p video recording, NFC for use with Google Wallet, Bluetooth 3, dual band Wi-Fi 802.11a/b/g/n, and a 1750mAh battery. Naturally, we can't wait to get our hands on the Samsung GALAXY Nexus, or the Motorola DROID RAZR, and see how well they stack-up next to each other. it's be great if they went with $250 for the 16GB and $300 for the 32GB being that the Droid RAZR is similarly spec'd with 16GB of internal memory and it's capable of expanding with it's microSD card slot and it'll be priced at $300 no doubt. Knowing Verizon, it'll be 299 and 399. I hope not. If its not expandable memory it SHOULD be priced at 199.99 and 299.99. Apple has all the hype right now (except us phone geeks). Pricing a 16 GB at iPhone 4s 32GB price would be a hard sell. For me personally, 16 GB is enough storage only because I have a 32 GB card and have only used about 7 GB. I change phones every 3-4 months. So I don't see myself filling up my memory that quickly. I've been working in mobile electronics since phones were a "luxury". I remember all of my phones and pagers and Holy crap. Tech moves so fast these days and if you're a technophobe like me, you can buy a new phone today and your phone is old news in what....... 6 and a half hours. This is an expensive habit. yeah i think 16GB is plenty myself especially with all of the cloud services there are now but $100 more for the only difference being storage space? i think i'd go with the Droid Razr if that really mattered so much because then you can have 32GB on top of the 16GB of internal storage. I wish but a 50 dollar difference on double the memory? Nope that's not going to happen. I'm afraid it might very well be 300 for the 16gb and 400 for the 32gb. Verizon loves to make their LTE phones at 300 dollars when they are first released. This is the Nexus and the first ICS device w e are talking about. Hopefully Amazonwireless will offer it with a much cheaper price. I'm getting it either way though, no doubt about it. you're talking about paying $100 more than the RAZR which has expandable memory for more internal memory which is becoming less necessary with cloud services. if they do price it at $400 for the 32GB version it won't sell well. I know, that's why everyone will get the 16gb model. Or maybe they are just going to release the 32gb one instead, which I hope they do. then why the 32GB at a premium? i'm sure the 32GB will be $300 and the 16GB will either fit in somewhere or it won't. If there is no micro sd slot, like with the iphone you are stuck with what you have as far as storage on your device itself. Sure there is cloud and what not but not everyone will use it. I would rather have more storage on my device and not have to worry about online storages. would you pay $100 to not use cloud storage on a 4G LTE device? Personally, yes I would and I can understand why others wouldn't. But yes I would pay an extra 100 dollars to have double the space on my device. well you spend money for no reason then. People buy the 32gb and 64gb model of the iphone because they want the extra space, not to throw away their money. Just because there is a cloud storage system doesn't mean everyone wants to use it. People will buy the same product and pay more for storage on the device on just about everything out there. I'm hoping they don't pull the same pricing crap with the Nexus though. $100 for an extra 16 GB is absurd given the current price of memory. iPhones and most products don't have 4G data and then with everything else we just migrate SD Cards. besides who fills up 32GB on a phone anyway? My friends and myself. I have a 16GB card filled up and I also have a 32GB card filled up. Lots of Movies and Music can fill up even 32GB cards easily. My car autoconnects via bluetooth. I have a rhapsody subscription, giving a couple hundred million songs on demand. I store a full 32g chip of my fav stuff to avoid any downstream lag. So yeah, 100 bucks extra blows, but I def will get the Nexus w higher storage. ps... 2011 Lexus ct200h hybrid. 42mpg CITY. ...you know that has nothing to do with your memory capacity right? oh that's cute. i have a 2012 Bentley Continental GT. 12mpg CITY so SMD. LOL maybe I just havent noticed until recently but you are on a mean streak! I like it! yeah, betta look out, I'MMA FIRIN' MAH LAAAZERRRR! BAHHHHHHHHHHHH! wow, there's a phone that I haven't heard in a long time. Ahh I still remember the commerical for it with the hot blonde chick trying to get to the phone. lol remember the good old days when LG was Verizon's best phone maker? I still have my original LG Voyager, one of my favs of all time. It's amazing how time just flies by in the cell phone world. The LG Voyager was only second to the OG iPhone. It had a touch screen(very small and narrow and annoying to use) BUT what made that phone also and even till this very day it had and still has one of the best keyboards ever. I use to be a text junkie when I had that phone. I use to text until my fingers would start to hurt and turn red LOL. oh yeah, dual screen clamshells made a lot of room for keyboard layout. my friend still can't get over his enV Touch's keyboard after all these years. Dude. You guys might remember the Voyager and the Dare... but I remember issuing warranty replacements for them. The Voyager I actually didn't replace often, but the Dare had some issues, and HOLY HELL the Env and Env 2 sucked. So did the Glyde. *eyes turn dark with rage* And the Chocolate. And the Z6TV. And the Krzr. And the s**tty little Pantech flips. I know there are a few models I'm forgetting. But nothing could have turned me off to LG worse than being in that warranty department. Oh yeah, the 8350 with its hinge that would just snap on people. That was GREAT fun! And don't get me started on Asurion. im right there with you.. FRUFEE!! !